Depending on the type of daytrader you are, you may (or may not) find this fast-moving, high risk trading system useful. It goes without saying that trading on a one minute chart is only viable if you are in and out of a position quickly. Taking on a strategy in this time frame means taking on a degree of risk, which can only be negated by using a super solid stoploss and take profit strategy. Over the next few months I’ll be posting up some systems which I’ve used, or have read about in various places during my time as a trader. First up is this fast one minute scalping system which can be used for trading stocks, futures or Forex. To get the best out of any one minute trading system you either have to have a trading account which allows you direct access to the market, or broker with a fast execution platform and super tight spreads. You are completely wasting your time trying to trade this time frame with a wide spread. First the chart set up. The term less is more has never been more relevant when it’s applied to a one minute scalping system. For this chart set up all you need is standard Bollinger bands and a 100 period exponential moving average. Firstly you need to create a rule to determine direction. Our rule here is determined by the 100 moving average. For a buy signal both the upper Bollinger band and the middle moving average of the Bollinger band must be above the 100 exponential moving average. For a stronger buy signal all three of the Bollinger bands should be above the 100 exponential average. 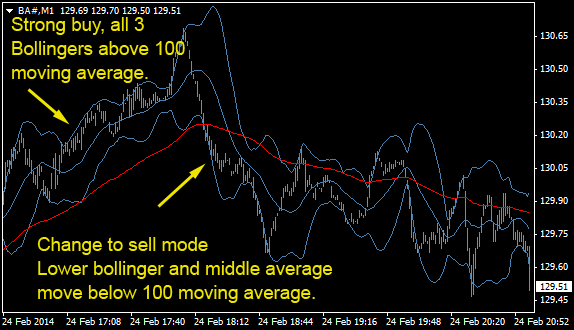 For a sell signal both the lower Bollinger band and the middle moving average of the Bollinger band must be below the 100 exponential moving average. For a stronger sell signal all three of the Bollinger bands should be below the 100 exponential average. There are things to look for which will become very apparent as you trade this in real time yourself. Make sure you test out this system on a demo account before you trade it for real, and make sure you get a feel for when the best trades might come. One of the things you might want to look for are the tightening of the Bollinger bands after a change in direction, often a small impulsive push comes right afterwards. Once you have determined if the price is in buy or sell mode you will then be looking to enter a trade. This system takes trades in the direction of the Bollinger bands into the extremes. So for instance on the chart below, buying mode has been established because both the upper Bollinger band and the middle Bollinger average are above the 100 exponential moving average. What you are then looking for is a candle to close “up” above the middle Bollinger band average. It’s important this is a bull candle, if the candle crosses the middle average but closes as a down candle you need to ignore this and wait for an up candle. Once an up candle has formed you are looking for the price to break beyond the high of this candle. Take a look at the example on this chart. The first highlighted area shows a candle closing up, which then moves higher on the open of the subsequent candle. This would be where you enter the trade. Your stoploss would be placed at either the last low in the price, or at the lower Bollinger band. I’ve shown this entry and stoploss level with two small yellow lines. This is now where practice comes into play. To keep your risk to a minimum you need to be fast and efficient at moving your stoploss up under the price. What you are looking for is the price to continue and approach or touch the upper Bollinger band. 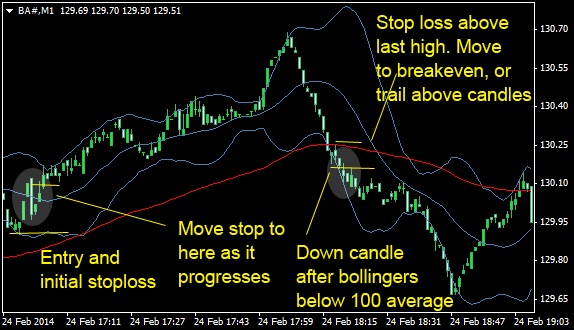 Once it moves towards the upper Bollinger band you need to move your stoploss up to the middle Bollinger band level. This will remove most of the risk from the trade. If the trade moves up sharply you may want to place your stoploss at breakeven right away (actual entry point). With practice you get a feel for the correct place to put your stoploss to allow your trade freedom to move. 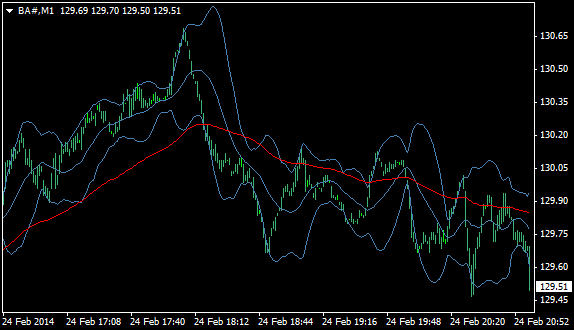 Often after the Bollinger bands have contracted price breaks out with a sharp move. If you are quick and get your stop to breakeven you can look to exit this trade somewhere between one or two times the risk (distance between your entry and initial stoploss). Ideally, if you risked 10 points you want to be taking between 10 and 20 points profit from a trade. If the move has been sharp you may want to try and lock in some profits, as often it can retrace quickly. Start moving your stoploss up from breakeven (or from the middle Bollinger) and trail it underneath the low of every candle that closes up. The next highlighted area on the above chart shows a sell trade. Once again you are looking for the lower Bollinger band and the middle Bollinger average to push below the 100 exponential moving average. Then you are looking for a candle that closes down, and the entry is triggered when the low of this candle is broken. Your stoploss is placed at either the last small high in the price, or at the middle Bollinger level, or at your maximum you are willing to risk on the trade. Bear in mind you want to keep the risk as small as possible on these trades to make this work. Once the price has moved down towards touching the lower Bollinger band you need to get your stop quickly to breakeven. Then either start to trail it down locking in your profit, or closing the trade between one or two times your risk. On the next example both Bollinger’s move below the 100 exponential average, you then get a down candle which triggers a sell trade. As the price starts to push down to the lower Bollinger band you get your stop quickly to the breakeven level. If you are fast enough and have practiced the system, it’s possible you may have closed out for one multiple of your risk. At worst you should have been stopped out at breakeven. The direction then switches and both Bollinger’s push above the 100 exponential average, confirming buying mode. Highlighted on the chart are the first candles which close “up” after the Bollinger’s move above the 100 exponential average. The break of the high of the “up” candle is your entry. Because the last low is quite far away I would suggest placing your stoploss at the middle Bollinger average as the price starts to break in your trade direction. The price quickly moves towards your upper Bollinger band and at this point is around 1.5 times your risk. Here you can either close out for a profit, or trail your stoploss under the low of each one minute candle until the price reverses and closes the trade. You might get another few points reward doing this. You will notice on the chart above that price continued up after the first trade. When you are first learning this system I would suggest you only take the first trade in any new direction. As you become more aware of how this system behaves, you might want to use the same entry and exit techniques to trade continuations of the trend. 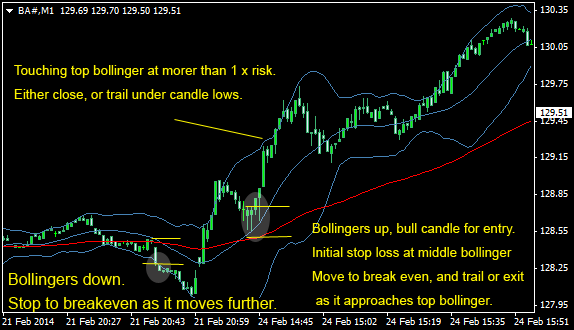 If it is a strong move and the price is above the middle Bollinger, every consequent touch of the outer Bollinger bands can lead to a profitable move which fits with your risk. I would suggest you set up a chart with the indicators as shown. Leave it open on your desktop and follow the idea visually for a few days. Even without placing a trade you can get a feel for how this works, and you will see where the opportunities are when the price touches the extremes at the Bollinger bands. Only then should you start to trade this on a demo account, and only after you’ve produced a few weeks of consistent profits in your demo should you be tempted to try and trade this for real. There are tools available for certain broker trading platforms (such as Interactive Brokers) which will help manage your stoploss is and exit points for you. You can set them up to complete tasks, such as move your stoploss 2 points, by clicking the software once to perform the action. They can also enter a trade and automatically place a stoploss at your maximum risk level at the same time. Tools like this are invaluable when trading such a fast-moving system. It allows you to focus on the trade/chart and manage it with one click of your mouse. If your broker doesn’t allow for the connection of third-party tools you can also try software like uBot (Google it). This is software which records any actions you make on your PC browser and saves them as scripts. For instance you could have one set up which places a trade and your maximum stoploss with one click, then you could have another set up which moves your stoploss by X amounts of points each time you click, and another which closes your position. Fast-moving trading systems need some sort of automation to help manage positions. I hope my explanation of this system is clear, any questions don’t be afraid to ask in the comments.